Why are we so prone to be negative? And how can we become more positive, both as individuals and as a society? The answer lies in the way we think. The key to positive thinking is developing new concepts, whether this means coming up with a brand new idea or just looking at an existing one in a new light. If we make a deliberate and positive effort to change our thinking we can secure a positive future, and we can harness the focused power of human thinking by releasing it from its pettiness. 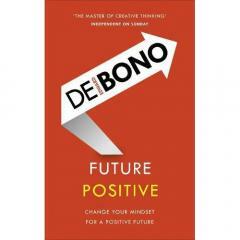 Edward the Bono is the Nobel Prize nominated father of creative thinking and the master of training the mind to think the right way. He wrote the multi-million copy bestseller Six Thinking Hats and many other revolutionary works on how to think. This classic work was first published in 1979, and since then our belief in the power of positive thinking has only become stronger.